Get ready to destroy those already shaky friendships all over again as Mario and his pals battle it out to be the true Super Star of the party. If you have yet to purchase the game, then step right up for our Super Mario Party review. Developed by NDCube and published by Nintendo, Super Mario Party is a welcoming return of the original formula. The Car mechanic is gone and everyone can now make their own way to collect Power Stars. The Mario Party Series began on the Nintendo 64. The series has been on a roller coaster ride with plenty of hit and misses. The later titles like Mario Party 9 and 10 have really taken their toll on the series. Though I must admit, I am one of the few that actually enjoyed Mario Party 10 on Wii U. I can also understand why people disliked it as well. There are many different modes that you can play but the end goal for Super Mario Party is to collect the five Gems for clearing the five main game modes. They are Mario Party, Partner Party, River Survival, Sound Stage and Challenge Road. After clearing all of these game modes can you claim to be the true Super Star. Super Mario Party may not be in Ultra HD but it still looks absolutely gorgeous. The graphics are colourful as always for a Mario game and Super Mario Party is no exception. The text is easy to read and there are hardly any sharp edges, though if you look close enough, you can see a little roughness around diagonal and circular edges. The character models are not the same as those in Mario Tennis Aces which, leads me to believe that perhaps they were built upon the models from Mario Party 10. The music is fun and upbeat with plenty of familiar tunes from the Mario Series. Well, you can’t have a good party without great music, right? And if you don’t like Super Mario Music, you are playing the wrong game. There are five main modes to play from which I touched upon earlier. Mario Party is the Free-For-All that up to four players go up against each other in a race of sort to collect the most stars. Players take it in turns to travel across the board whilst collecting coins and trying not to land on any bad spaces. There are a number of different spaces. Blue spaces give you coins, red spaces take coins. The mushroom coin will allow you to receive an item at random via a slot machine block. The Ally space will allow an NPC to join you and give you the option of using their special dice. There are some minigames that also allow allies to play alongside you like Pull It Together, Just For Kicks and Bumper Brawl. You can’t just pick up stars willy-nilly however, as first you need will enough coins to purchase them. Coins can be earned by landing on blue spaces, winning minigames and stealing them from other players. Depending on special character dices you own, you can even get coins from them as well. Each character has a standard dice and a special dice that are different for each character. Some are risky with 0’s and 10’s, whereas others play it safe with more faces with 3’s or 4’s. Strategy is just as important as winning minigames. The tide can turn at any moment and players can also steal each other’s Stars, if they find Lakitu and pay the price. The price being 30 coins and the possibility of a black eye or a dead arm from your now ex-friend. If you land on a bad luck space, you stand the chance of losing coins or worse… Stars. There is nothing more rage infusing than losing one of your hard earned stars and to top it off, the star goes to your rival and beats you to first. You will be proclaiming that the whole thing is rigged and demand your star back like a deranged maniac. If that does happen, don’t worry. You will soon be able to settle wrongdoings in Super Smash Bros. Ultimate soon enough. Event spaces can be found scattered all over the boards and can activate any number of things. Depending on where they are, they can activate traps, lower countdowns or cause Mega Blooper to go haywire on you. Not all are negative though. Some event spaces allow you to travel down pipes to other areas, mine for gold coins or change the price of Stars. Lucky Spaces give you an opportunity to win coins or mushrooms that will add extra moves on your turn. There are a number of items that you can either pick-up or purchase on certain spaces. These items can range from mushrooms to coins or Golden Pipes to take you close to the power stars. The ally phone calls up an ally to lend a hand (and their dice). The Peppa Bell rings Peppa the ghost to follow another player around for 1 turn, making them lose a coin for every space they move. After everyone has had a turn, it will then be time for a minigame. The minigames can range between free-for-all, 2 vs 2 or 3 vs 1. Depending on your final position in the minigame, you will be awarded a varied amount of coins. Minigames are the bread and butter of earning coins so trying to win them should be a top priority. After all, turns have been played out, it is then time for the announcement of the Bonus Stars. Two Bonus stars are up for grabs but their requirements are chosen at random. They can be anything from having the most allies, winning the most minigames or travelling the fewest spaces. If you were toe-to-toe with another player, the ultimate winner could be anyone’s guest. Partner Party is an elaborated version of Mario Party: Star Rush. Players are free to move around the board anywhere they like and must collect stars whilst picking up allies along the way to help maximize the distance they can travel with extra dice. You are also teamed up with another player and must work together to collect coins and buy stars. You can split up so that players can cover more ground. One player could head for the Star, while the other gets as many coins to help pay for said star. You can earn extra coins by stomping on other players when you pass through their space. You can also get more coins if your final space is the same as an opposing player. For those looking for a more cooperative setting with everyone working together, River Survival might be right up your stream. Players must row together and traverse the treacherous waters whilst trying to pop balloons. The balloons allow players to take part in co-op minigames with the reward being more time added to the ticking clock. The River branches off with multiple hazards between you and the five end goals. Only by cooperating and winning as many minigames as you can, will you make to the end of the river within the time limit. If you like to really get up and go, then be sure to check out the Sound Stage. Sound Stage has players compete against each other in rhythm minigames. Show off your cool moves and your ability to keep up with the beat and even take a dance lesson or two with Waluigi because, why not? There are three levels difficulty; Normal, Remix and hard. To be fair, Remix isn’t a difficulty but it does have you play more games in a sequence than Normal or Hard. For the lone wolves out there, Challenge Road will test your skills in the 80 minigames that Super Mario Party offers. This mode is not available at first and needs to be unlocked. Once unlocked, you will have to play through every single minigame that are divided over six ‘worlds’ and complete challenge requirements. There are checkpoints at various intervals that allow you to take a break from the Challenges. At the end of each world awaits a challenger that you have to face one-of-one. These challenges can be tougher as the AI is made slightly more difficult. All minigames that have been unlocked can be played at any time in Minigames mode. There are two sub-modes as well; Mariothon and Square-Off. You can also view your best times in the Records menu. Another mode with its own set of minigames, separate from the main minigames, is Toad’s Rec Room. These games can be played with the Switch laid flat on a table surface. With the exception of one game, the others can be played on a single Switch console. The Banana Match-up game requires two Switch consoles to combine the right Banana images. The Tank Battle Minigame can be played both on a single console and by syncing up two consoles. When playing the different modes, you will be awarded Party Points. These points are used to purchase tips, stickers and music. You can use the stickers to make your own dioramas. Shiny stickers can be purchased at a much higher price or can be unlocked with the corresponding amiibo. Music that you purchase can be listened to whenever you like for when you want a little background music. You don’t buy individual songs but rather a selection of songs that are grouped together by the modes they feature in. There are 20 characters to choose from with 16 available from the start and 4 to be unlocked. The usual suspects are all here; Mario, Luigi, Donkey Kong, Yoshi, Wario etc. Newcomers to the series include Goomba, Monty Mole and Pom Pom. Some characters also make a return like Boo, Koopa Troopa and Bowser Jr. The roster is certainly an expansive one and though there is plenty of room for other characters to make an appearance via DLC, I think there is plenty of variety already. One thing that people might not like is that there are only 4 different boards to play in Mario Party and Partner Party. The boards are diverse enough to warrant replayability but with themes like ghost house, underwater or even Bowser’s castle absent from the list, a few extra boards would be much appreciated to help expand the longevity of Super Mario Party. As regards to online play, players can play online Mariothon which pits players all over the world, friends or random strangers, against each other in a string of minigames. There are people that are somewhat disappointed that they can’t play a full game of Super Mario Party with other players but let’s think about this for a moment. Mario Party sessions last around about an hour. Lag and latency issues will no doubt rear their ugly head at some point and could cost players coins or stars at the worst possible moment. The possibility of people rage quitting halfway through would just spoil the game and you will almost never see the end of a full playthrough of Mario Party. Single Joy-Cons are the only way to play Super Mario Party. The Pro Controller is not compatible nor are any other controller configurations (that means handheld mode is out of the question too). Due to the nature of how the minigames are played, they rely on the maneuverability of the Joy-Con as you twist, turn and rotate it in your hand. Some minigames use button inputs but mostly all are motion based, HD rumble is also supported and is used in minigames as well. After using the Pro controller with all my other games, it did feel odd to resort to only the Joy-Con at first. However, the more I played Super Mario Party, the more it made sense. It never felt uncomfortable or made my hands cramp, perhaps because you never really held it in the same position for more than five minutes at a time. Super Mario Party really aims to make right the so many wrongs that have come before in previous titles. As with most of the later titles in the series, Super Mario Party makes use of its controllers gimmicks to play minigames as opposed to just plain button mashing. It could be compared to 1-2 Switch but with Mario’s face on it but it is much more than that. I do feel that Nd Cube has gone back to the roots of the original Mario Party games but not without adding some new features and game modes on top. 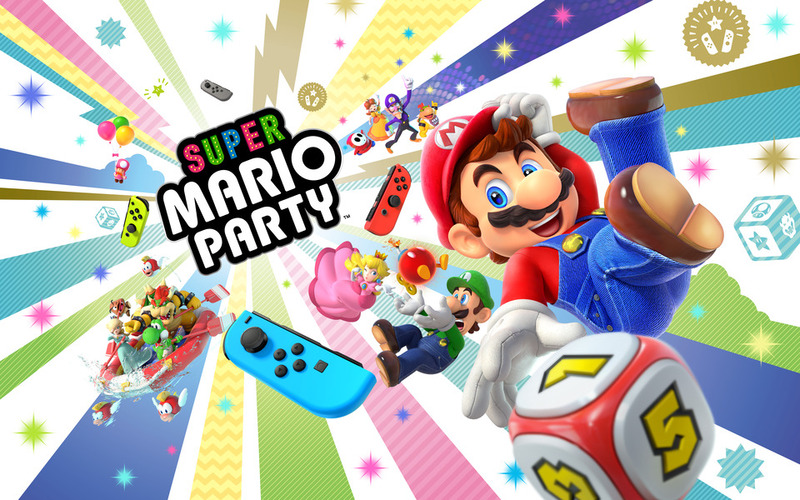 I welcome this with open arms because I do enjoy Super Mario Party and there is enough content there for it not to become too stale at actual parties or group gatherings. The music is funky and uplifting. Gameplay is fun and enjoyable and you are bound to get plenty of hours of replayability out of it. Even if you run out of friends to play with. The AI is always down for a Mario Party. A Welcome addition to any Switch owner’s collection and is ideal to play anytime, anywhere as long as there is a flat surface nearby or a TV with a dock. I’m just so happy it’s actually good. When I heard about this I thought… oh god here we go again, I hope they don’t mess this one up… Especially since it’s such a perfect type of game to have on the Switch, not only because of all the things you can do with the Joycon but because it’s a good kind of multiplayer game to play when you take your Switch to a friend’s house or something. Haven’t gotten it yet but I’ll definitely be getting it eventually. That’s great to hear. Super Mario Party is a great game for Switch. The minigames are fun and diverse. It can still be rage encouraging but hopefully we’re all old enough now to not let it ruin friendships.